Almost every weekend DK and I eat brunch on Saturday and Sunday. Unfortunately, we didn't make it to Rustic Canyon on Saturday because I had an appointment that ran late. We tried Cora's Coffee Shop again and didn't have the best meal. I like their Burrata Caprese Omlette with heirloom tomatoes and a side of their brioche toast, their vegetable frittata (one of the best I've ever had) and their Caesar salad because it's made with truffle oil essence. But the service is kind of slow, so don't expect to get in and out of there quickly. Sunday I had to take DK to try Anisette. Some cool things about Anisette. They take breakfast and brunch reservations--practically unheard of in LA. Also, this weekend their brunch hours will start. Breakfast: 7-10 am Brunch 10-5 pm. (Next Monday dinner will be served. Lunch service is available now). Why aren't more restaurants opened until 5 pm for brunch? I love that Alain Giraud will soon be curing his own salmon instead of serving Michel Blanchet's--which I added to my eggs Florentine. The coolest thing is that they had what they called an almond-crusted croissant as a special. It was one of the best almond croissants that I've ever had. Their French pastry chef last had a gig at Coral Tree Cafe as their executive pastry chef and before that was at Breadbar. One of my other favorite almond croissants in town is Breadbar's. (I also like the one at Grateful Bread, but they only make it if they have a lot of leftover croissants. I think I've had it once.) There seems to be a lot of almond croissant lovers all over--even in France they were very popular. My favorite one there was at Lenôtre in Cannes. 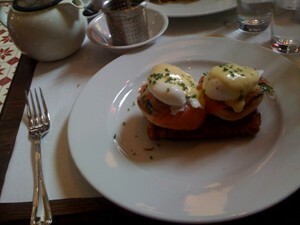 I liked my eggs Florentine. 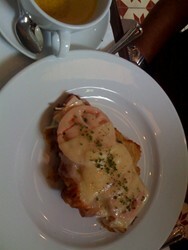 The hollandaise sauce wasn't overly lemony, which I hate. I also didn't feel like I was going to gain 5 pounds after eating it. (Maybe that happens because I usually ask for a side of hollandaise sauce?) I was charged an extra $6 for the salmon that seemed steep for such a small amount. I'd rather go to Geoffrey's and have a view of the ocean and pay $20 for their Scotch Benedict. DK's croissant sandwich wasn't for me, but he liked it. The croissant was very tasty and the Gruyere cheese was luscious, but I would have liked the tomatoes cooked and the turkey wasn't anything special, though it was smoked. Service was good except when we needed out plates cleared, and it took some time to get our check. The restaurant was incredibly busy. I’m sure once they’re open a bit longer, service will be smoother.